If you're ever out in the open ocean and you see a hungry great white shark headed your way, you'd better hope that shark is a teenager. Younger great whites lack the jaw strength necessary to bite humans to death. "We were surprised that although the teeth and jaws of our sub-adult great white shark looked the part and the muscles were there to drive them, the jaws themselves just couldn't handle the stress associated with big bites on big prey." "It is hard to believe, but at this size great whites are basically just awkward teenagers that can't hunt large prey very effectively. It seems paradoxical that the iconic jaws of great white sharks - made infamous by the classic Steven Spielberg movie Jaws - are actually rather vulnerable when these sharks are young. 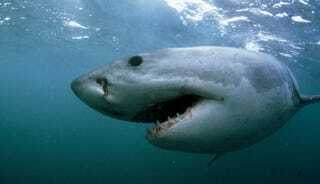 Great white sharks are not born super-predators, they take years to become formidable hunters." "This study may also explain why many of the shark attacks off NSW are aborted after a single exploratory bite, as the great whites involved are usually juveniles that might sustain jaw injury if they persevered with the attack." This research isn't all bad news for sharks, though. The scientists found that sharks have a unique jaw muscle arrangement quite unlike anything mammals have, which allows them to bite with significant force no matter how widely they have opened their mouths.